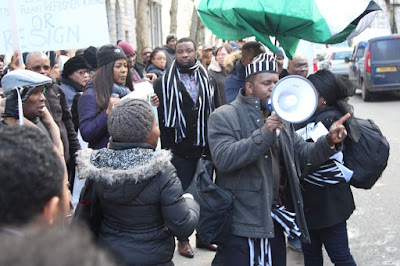 The Mzough U Tiv UK (MUTUK) on Monday 22 January 2018 organised a peaceful protest against the Fulani herdsmen barbaric killings in Benue and other states in Nigeria. 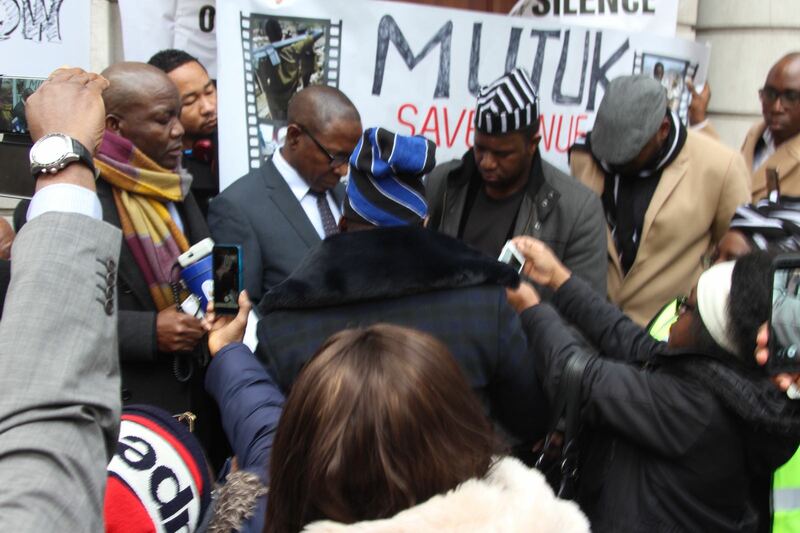 Nigerians in Diaspora came out in numbers to support this struggle. It was a Nigerian affair. one hour. 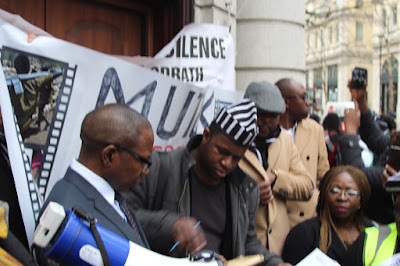 Dr Kohol Shadrach Iornem, the Vice President of MUTUK who was the convener of the protest, approached the security staff at the Business Section of the High Commission and was advised to go back to the main entrance. Even after going back and forth repeatedly, no member of staff came out. 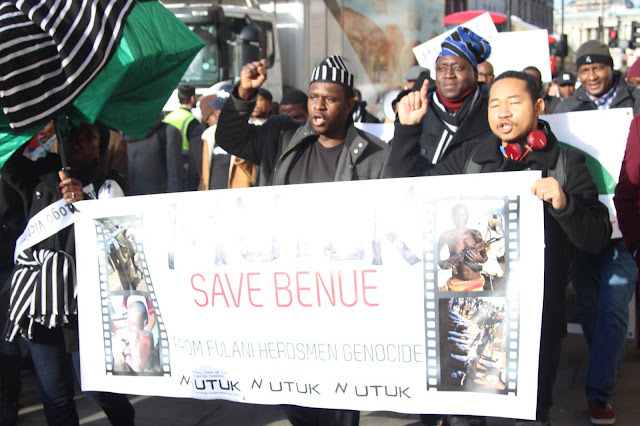 Dr Iornem urged the protesters to move down to the Business Unit of the Nigeria High Commission. At this point, the Nigeria Embassy called the police of the Nigerian protesters. When the police arrived, Dr Iornem explained to the police that protesters were here to submit a copy of the petition to Ambassador but they have not come out to address or receive the petition. He stated that courtesy demanded that a member of staff from the High Commission addressed the gathering and received the petition. It was at this point that the Head of Chancery, Dr Niyi Ojo, came out to speak to the protesters on behalf of the High Commissioner. Dr Iornem, in his speech to President Muhamadu Buhari, through the ambassador was straightforward. He stated “we are here today because of the current problems we are facing in Nigeria in the hands of the Fulani herdsmen who have continued to massacre our children, brothers, sisters, mothers and fathers. We are here because our people back at home have done everything within the law to bring an end to this ethnic cleansing. Our people back at home in Benue State have protested, they have held press conferences, they held meetings with community leaders to discuss the solution to these attacks, they have passed the anti-open grazing bill. Our leaders back at home have even visited President Muhammadu Buhari to plead with him to take decisive actions. It is sad that immediately after their visit, the Fulani herdsmen terror group killed at least 6 persons in the same Guma and Logo Local Governments where over 70 people were initially massacred and given state burial. We believe the international community do not know about the current genocide in Nigeria and that is there has been no reaction from them. We are here today to let the British Government know about this terror group who have killed more Nigerians than the Boko Haram. It is the responsibility of any government to protect the lives and properties of its citizens and the government have failed us in this regard. In developed countries, the President ought to have tendered his resignation for failing the people who elected him. He is the President of the Federal Republic of Nigeria and not president of a particular ethnic group. This is just the beginning. If President Muhamadu Buhari does not take immediate action to address the brutal killings of our defenceless people, Nigerians will come back here again. Dr Iornem on behalf of MUTUK submitted a copy of the petition to the High Commissioner, represented by Head of Chancery, Dr Niyi Ojo. 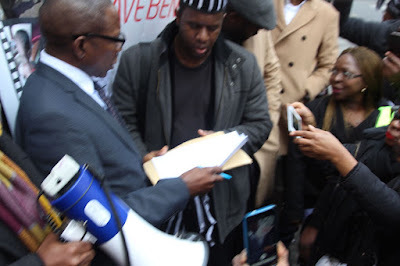 Dr Ojo in his response stated that he will pass across the petition to the Federal Government. 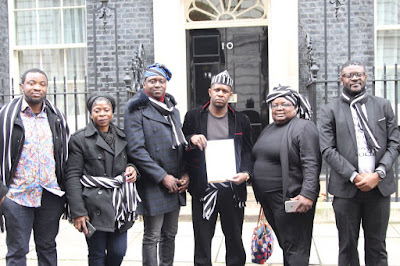 The peaceful protest then continued to 10 Downing Street to where they group were to deliver their petition to the British Prime Minister. Dr Kohol Iornem, the Vice President was accompanied by five other MUTUK executives including the President (Kuram Gwakyaa) Salome Publicity Secretary (Sulleyol Biam), Social Secretary (Veronica Jato), Chief Whip (Bemdoo Aleva) and the Ex-President (Martin Akiga). 2. Evoking the necessary international mechanisms to establish the veracity of the substance of this petition. 7. Providing advice to the Federal Government of Nigeria on finding ways to deal with the political and economic dimensions of pastoralism by reducing conflict with farming communities. 8. Emphasising, that pastoral nomadism is no longer practicable in this era of rapid population growth and climate change. 9. That the Nigeria government and the international counter-terrorism coalition, investigate the possible link between the Fulani terrorists and Boko Haram insurgency and the flow of illicit arms from failed states in the African sub-region, with emphasis on the nexus with Libya and Niger. In an interview with journalists, Dr Iornem briefed the journalists about the details and purpose of the protest. 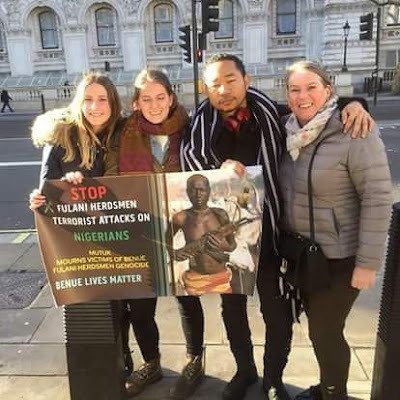 Asked whether the organisers were paid to carry out the protest as alleged by one Mrs. Jaiyeola Mohammed, Dr Iornem debunked the story as mere falsehood. He stated that “do you truly believe people will be paid to protest against those barbaric killings? Any right thinking individual that sees those disturbing images and videos of the gruesome murders and refuses to speak against it, that person is also part of the problem. Instead of those vested with powers to take immediate actions to address the barbaric killings, they are busy carrying out senseless propaganda. 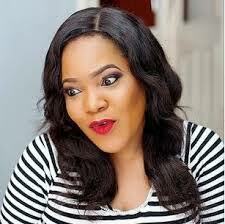 It is very disturbing that some people actually believe Mrs Jaiyeola Mohammed. I stand here today to state that we have not received any money from anybody.